Almost 70 children throughout the area participated in Assemblyman Will Barclay’s summer reading program. 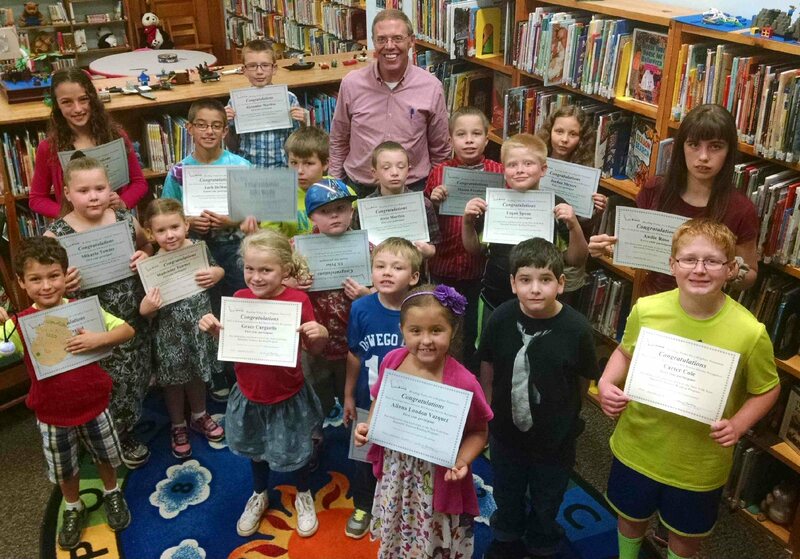 The recognition party was held Sept. 26 at the Fulton Public Library. Barclay read two stories and handed out certificates to those in attendance. Snacks and crafts were also provided. Pictured in front is Aliana London Vazquez (Fulton). In second row are Henry Jerred (Fulton), Grace Carguello (Pulaski), Evan Rood (Pulaski), Roland “Joey” Stewart (Mexico), and Carter Cole (Baldwinsville). In third row are Mikayla and Madeleine Towner (Mexico), Eli Prior (Fulton), Logan Spoon (Fulton) and Andie Rose (Oswego). In fourth row are Mary Jerred (Fulton), Zach DeMott (Oswego), Miles Bandla (Oswego), Jesse Marthia (Mexico), Mason Freebern (Fulton) and Jordan Meyers (Fulton). In back row is Alexander Marthia (Mexico) and Assemblyman Barclay.